Copper Leaf Financial is honored to be voted as the Vermont Business Magazine (VBM) 2018 BOB Award Winner for "Best Financial Planning/Investment Firm" for the 2nd consecutive year! VBM's "Best of Business" (BOB) Awards set out to identify the best "stand-out businesses" in the Green Mountain State. The survey differs from other “best of” surveys due to its “business to business” focus. *VBM collected nearly 1,000 online votes from area businesses, so the firm is very humbled to be selected for this award. VBM readers choose the winners! Starting on January 1, 2018 and closing on March 1st, VBM surveyed its magazine and digital subscribers. They asked their readers – the business leaders of Vermont – who they trust to provide their services in over 100 different categories. They compiled the go-to list in the state for everything from Best Bank and Best Public Relations Firm to Best College for an Online Degree. Some of the questions and answers were based on a regional perspective (as noted) while most of the categories were looking for statewide winners. 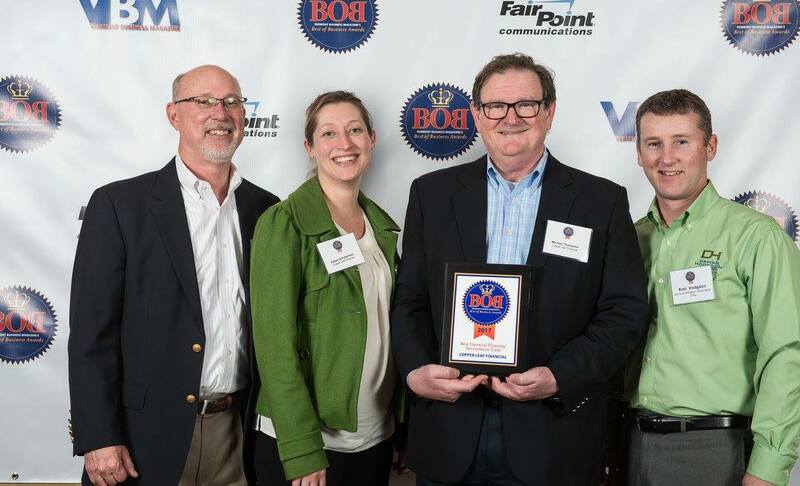 John W. Davis, partner, Rebecca Fetterman, Client Services Associate, Michael L. Thompson, partner and Bret L. Hodgdon, partner receiving the 2017 VBM BOB Award in May 2017.